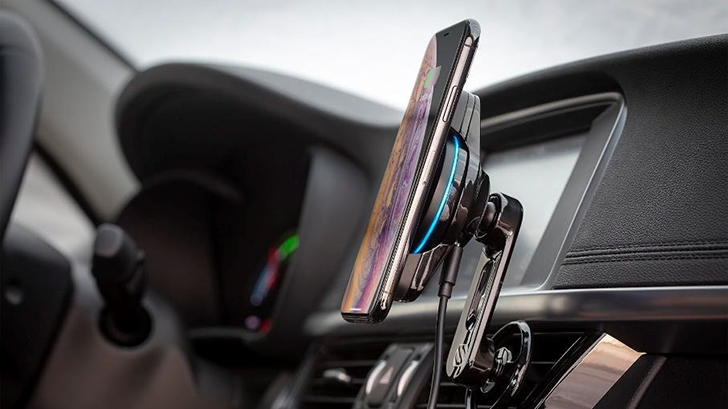 The phone mount clips on to your car's air vents, and has a 360-degree adjustable arm to keep your phone from blocking airflow. The MagicMount sticks to your phone with magnets, and has a 10W Qi wireless charging pad in the middle. 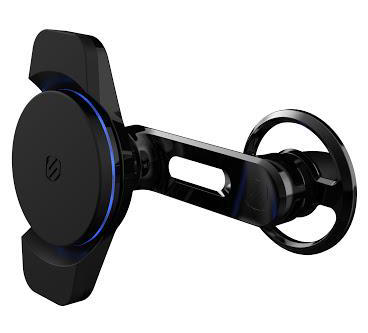 The MagicMount definitely looks like a great way to use your phone in a car, assuming the adjustable arm can handle larger devices. Scosche didn't reveal pricing details, but the mount should become available sometime this spring. (literally) with the MagicMount Charge3. distinct design and unique functional advantages. First, it is available in a vehicle vent mount. options, including moving the phone completely away from the vent, while still anchored there. normal charging and flashes red to indicate foreign object detection. safer for the life of the device’s battery, as well as the device itself. multiple angle options and adjusts to hold firmly once you’ve achieved the desired angle. flat surface at home, in the office, or in-vehicle. base that offers multiple adjustments and viewing options. SCOSCHE develop products that reflect a rich heritage in audio and mobile technologies. forefront of technology and innovation.